Prices of United States Mint gold coins may increase tomorrow, June 11, one week after they dropped by $50 per ounce of precious metal content. Wednesdays are when the U.S. Mint averages gold prices to check whether it should reduce or raise prices on its numismatic gold coins. According to the Mint’s pricing policy and based on a slightly improving gold market, chances are stronger for hikes across 17 gold products in amounts ranging from $5 to $92.50. 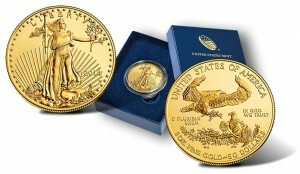 Coin News Update: The U.S. Mint increased coin prices on Wednesday. New prices are listed in the "To" column further below. Current prices for the bureau’s gold coins are based on a London Fix weekly average that is within a range of $1,200.00 to $1,249.99 an ounce. London gold fixings from June 5 to June 10 average $1,252.53 an ounce. The yellow metal has popped up $6 on the day, and is now trading near $1,260 an ounce. 2013 First Spouse Gold Coins include the 10 uncirculated and proof coins depicting former first ladies Edith Roosevelt, Ida McKinley, Edith Wilson, Ellen Wilson, and Helen Taft. If pricing adjustments are required, the U.S. Mint usually suspends ordering for the affected products for around 30 minutes until new prices are entered and verified. This tends to happen near noon (ET). U.S. Mint numismatic products may be ordered from www.usmint.gov/catalog. This coin news article will get updated with what actually happens.